"THEY'RE HERE," playful at first... but not for long. A storm erupts, a tree attacks and little Carol Anne Freeling is whisked into a spectral void. As her family confronts horrors galore, something else is 'here' too: a new benchmark in Hollywood ghost stories. Producers Steven Speilberg and Frank Marshall and director Tobe Hooper head the elite scream team of this classic. Welcome to Home Sweet 'Haunted' Home. I first saw at least some of this movie on television years and years ago. I believe it freaked me out a bit at that point, but I liked it too. I would watch it when I found it on and I finally decided to pick up the DVD a few weeks ago. This was the first time that I had watched the movie in a long time and I had forgotten some things. The movie does have a somewhat slow build up with what is going on as things are set up and introduced. The plot isn’t that complicated, but it really isn’t simple either. The movie is rated PG, which surprised me a bit even though it really isn’t as ...extreme enough to get an R rating. There are things in the movie that I could see upsetting or scaring younger viewers. As it is, that clown doll was freaking me out a bit, even when it was just sitting there like a normal toy. I think if I had seen the movie as a child, I would have developed clown issues. There is a decent amount of suspense in the movie and some scare moments. The special effects have held up well, especially considering when the movie was made. Overall, this is a really well done movie dealing with a haunted house. This one is a bit corny at times, but it is really fun and entertaining. Some things about the movie do look a bit dated, but I think those things still work fine with what is going on. Some of what happens is more predictable, which may bother some people. Even with the predictability, the movie is still very entertaining. There really isn’t anything new about vampires shown in the movie, though by the end, some vampires end up with rather unique looks. Overall, this is a very entertaining vampire movie that has held up well and still deserves to be seen. The movie is rated PG, which surprised me a bit even though it really isn’t as ...extreme enough to get an R rating. Marie don't forget that no rating existed between PG and R in the United States when this film was released in 1982. The PG-13 rating was created only in july 84 because of Gremlins and Indiana Jones and the Temple of Doom. I know. I had just forgotten when the movie came out..and I guess I had thought it was rated R because of a few scenes. Ash (Bruce Campbell), the sole survivor of THE EVIL DEAD, returns to the same cabin deep in the woods and again unleashes the forces of the dead. With his girlfriend possessed by demons and his body parts running amok, Ash is forced to single-handedly battle the legions of the damned as the most lethal - and groovy - hero in horror movie history! Welcome to EVIL DEAD II: DEAD BY DAWN , director Sam Raimi's infamous sequel to THE EVIL DEAD and outrageous prequel to ARMY OF DARKNESS! This unhinged horror classic is now fully remastered in state-of-the-art Dolby Digital 5.1 supervised by THX and packed with extras. So, sit back, strap in and rev up the chainsaw: EVIL DEAD II has returned... like you've never seen or heard it before! Since I really enjoyed Evil Dead once I finally watched it this year, I decided to pick up the 2 sequels. I know there has been some issues over whether Evil Dead II is a sequel or remake. With how it starts off, I can see why some feel it is a remake. But I have read a few different things that say it is a sequel. The first several minutes are just intended to be a recap and there was some issue that prevented footage from the first movie being used. Once the recap is done, the movie picks up where the first one ends, with the evil force or whatever it is going after Ash. There is still gory violence in this movie, though I think there may be less than there had been in the first movie. There is a good amount of humor added, mostly from how Ash deals with certain things. Some people may not appreciate the humor, but I think it works really well for the movie and I like it. There is enough different with the new characters to keep it from being a complete copy of the first movie. The movie also sets up the next one in the series. Overall, I really enjoyed the movie. I did manage to get a review posted on Epinions. All primitive screwheads, listen up! Cult superstar Bruce Campbell (Evil Dead) reunites with director Sam Raimi (Drag Me to Hell, Spider-Man) to battle the deadly forces of evil in Army of Darkness – the outrageous, effects-fueled action epic that will make you scream with fear and laughter. Forced to lead a makeshift Dark Ages army against the demonic Deadites, who possess all the deadly magic of hell, the shotgun-toting, chainsaw-armed, reluctant 20th century time traveler Ash (Campbell) must save the living from the dead, rescue his medieval girlfriend and get back to his own time. 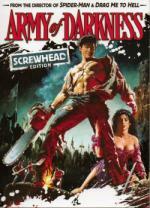 One of the most popular horror comedies of all time, now digitally remastered and featuring 5.1 surround sound, Army of Darkness Screwhead Edition is drop-dead fun! This one also starts off with a short recap and again basically eliminates some of the other characters. Linda is briefly shown again, with another actress. Ash being stuck back in the middle ages is very entertaining. 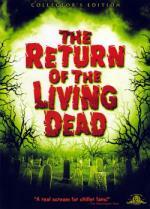 This movie went more for the comedy than the horror aspect, so some fans of the first movies may be disappointed. I loved it and think it worked really well for the plot. The special effects are pretty good, though some of them do look slightly cheesy. The plot does seem a little weaker and a few sequences do seem to run on a bit too long, but the movie is still really entertaining overall. It is definitely worth watching. In the sleepy little town of Fairwater, a monstrous evil has awakened... an evil so powerful, its reach extends beyond the grave. Director Peter Jackson and Executive Producer Robert Zemeckis unleash a riveting thriller with the most spectacular special effects this side of the hereafter. For Frank Bannister (Michael J. Fox), death is a great way to make a living: ridding haunted houses of their unwelcome "guests." But he's in cahoots with the very ghosts he promised to evict! It's the perfect scam... until Frank finds himself at the center of a dark mystery. A diabolical spirit is on a murderous rampage... and the whole town believes Frank is behind it. Boasting music by Danny Elfman, co-starring Trini Alvarado, Jeffrey Combs and John Astin, this supernatural chiller is so fiendishly entertaining, it's scary! I remember being completely freaked out by the trailer when this first came out and I though there is no way I will ever see it. Several years later I was looking for something to watch late one night and found a movie with Michael J. Fox in it..so I left it on and it turned out to be Frighteners. It was a bit weird and bizarre, but I loved it. I think the plot is rather unique and creative with everything that is going on. I had no idea how things were going to work out the first time I watched it. I don’t think it is predictable at all. It does turn more violent as the movie progresses. I think there is also a decent amount of humor to what is going on. Everything works very well for the story. The special effects are very well done and have held up well. This is a wonderful movie that I really enjoy. Some people may not appreciate the humor, but I think it works really well for the movie and I like it. This movie went more for the comedy than the horror aspect, so some fans of the first movies may be disappointed. It wasn't really...though I do remember you mentioning you didn't like the 2nd and 3rd movies as well. The Frighteners was Peter Jackson's first foray into Hollywood and somehwat set the stage for the Lord of the Rings Trilogy. You fogot to mention Jeffrey Comby's, a genre favorite, outstanding and hilarious perfomance. Oops..not sure how I managed to forget that. Thanks Rich and Emma..glad you enjoyed the review. You should give check it out Emma...really entertaining movie. I decided to add this one to my collection this year. I think I have only seen bits of it on television before. I know I’ve seen the sequel several times and I did enjoy it. The movie has a decent blend of humor and horror elements that works well overall for the plot. The plot is more unbelievable, but it manages to work. Many of the characters are just idiots, but that also works with what is going on. The movie shouldn’t be taken seriously at all, but it does make for an entertaining movie. The effects are decent, though nothing that special. The violence isn’t too extreme, though it could bother some viewers. Overall I enjoyed this movie.